Note: Polished & red finishes have been discontinued. We have limited quantities of blue remaining in stock. Jazz up your engine bay with an MPx Oil Cap, or get one to match your powder coated valve cover to have a matching set. 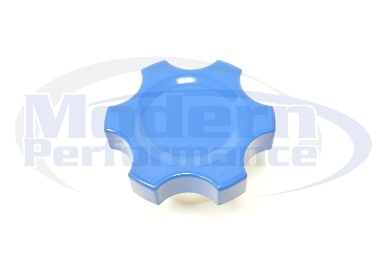 We at Modern Performance were tired of using universal oil caps on our Chevy Cobalt project cars, so we designed a new oil cap from scratch that fits nicely in your hand. We wanted something that was designed directly off the stock oil cap thread designs, so it would fit snugly and seal well. Here you have it. American made, CNC machined, aluminum oil caps, with rubber O-ring seals, available in polished, red, and blue.